This stunning original art sketch features the pencils of Alan Davis and inks by Mark Farmer. Frequent collaborators, they’ve worked together on everything from Batman, the Avengers, and the X-Men to the Justice League, the Fantastic Four and the Hulk. This sketch feature the Dark Knight Detective himself and is certified authentic by CGC as part of their special Signature Series. 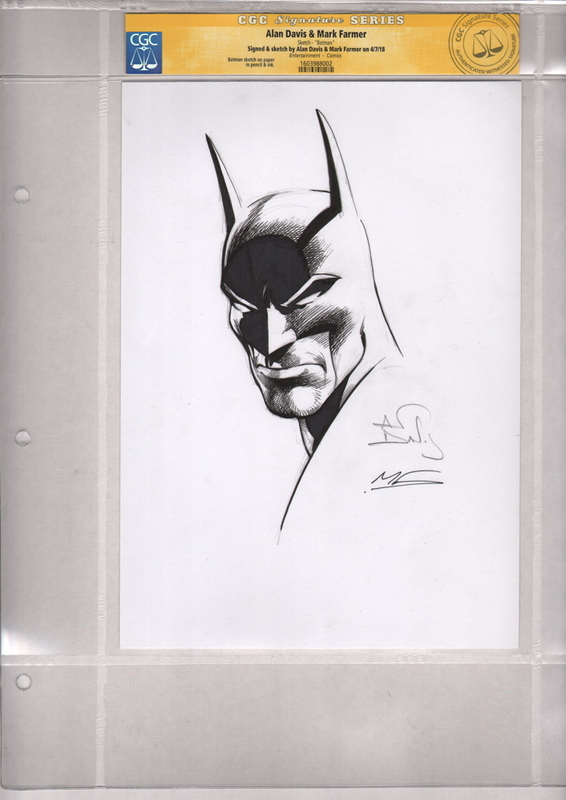 With CGC’s Signature Series, a certified witness actually observes the signing/sketching and then immediately takes possession of the collectible so there is no chance for the real autograph/sketch being replaced or substituted. It measures approximately 8 1/4 by 11 1/2 inches (the CGC plastic protective sleeve it is encapsulated inside measures approximately 12 1/2 by 16 1/4 inches… scanner cuts off a little of the right side of the plastic sleeve), is in excellent condition and will be shipped with the utmost care.